Heat oven to 450°F. Place pie crust in 9 1/2- or 10-inch glass deep-dish pie plate as directed on box for One-Crust Filled Pie. In medium bowl, crumble 9 of the refrigerated cookies. Add flour; toss to coat cookie dough. Sprinkle 1 cup of the cookie dough crumbs in pie crust; lightly pat down. From remaining crumbs, remove raisins; set both crumbs and raisins aside. In large bowl, crumble remaining 3 refrigerated cookies. Add 1/2 cup of the caramel topping, the apples and reserved raisins. Toss to coat apples. 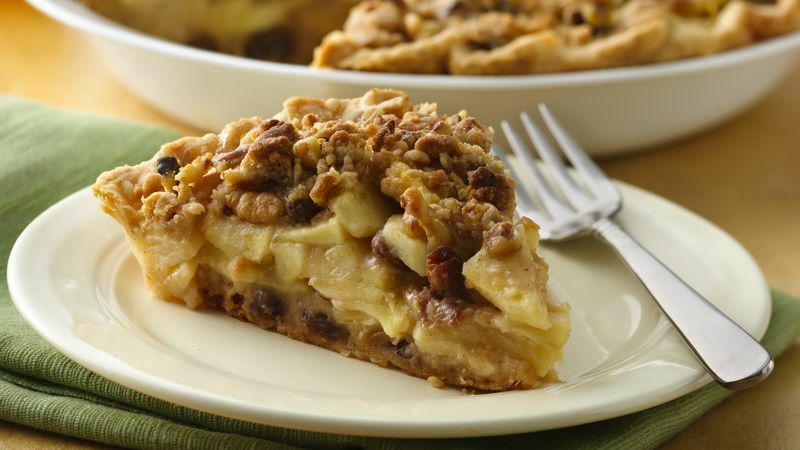 Spoon apple filling into pie crust. In small bowl, mix reserved crumbs and walnuts. Sprinkle over top of pie. Bake 15 minutes. Cover pie loosely with foil to prevent excessive browning. Bake 30 to 35 minutes longer or until crust and top of pie is golden brown. Cool 1 hour before serving. Drizzle with remaining 1/4 cup caramel topping. Serve each serving with dollop of whipped cream.